The suprahyoid muscles consist of following 4 matched muscles. It is composed of posterior and anterior bellies and is a strap like muscle, united by an intermediate tendon. This muscle is called digastric, because it has 2 abdomens. The point of origin of bipinnate posterior abdomen is from the mastoid notch of the temporal bone. The unipinnate anterior abdomen appears near the symphysis menti, from the digastric fossa on the lower border of the mandible. Posterior abdomen enters downwards and forwards between the carotid triangle below and behind and digastric triangle above and in front and added into the intermediate tendon. Anterior abdomen enters downwards and backwards on the mylohyoid to be fit into the intermediate tendon. The intermediate tendon is anchored to the junction of the body and greater cornu of hyoid bone by an inverted U-shaped facial sling of investing layer of deep cervical fascia. The tendon of digastric muscle enters between the 2 slips of tendon of stylohyoid muscle. The posterior abdomen grows from mesoderm of the second pharyngeal arch and for that reason, supplied by the facial nerve. The anterior abdomen grows from the first pharyngeal arch and, thus, supplied by the mylohyoid nerve, a branch of inferior alveolar nerve from mandibular nerve. Helps to depress the mandible when the mouth is opened extensively against resistance. Pulls the hyoid bone upwards during deglutition. Skin, superficial fascia, platysma and investing layer of deep cervical fascia. Mastoid process and sternocleidomastoid muscle. Parotid gland and the angle of the mandible. Neurovascular bundle of neck being composed of internal jugular vein, external and internal carotid arteries 10th, 11th and 12th cranial nerves. Upper border: Stylohyoid muscle and posterior auricular artery run along the upper border of the posterior belly of the digastric. Lower border: Occipital artery runs along and under the cover of the lower border of digastric. The connections of posterior belly of digastric are essential because 3 cranial nerves: 10th, 11th and 12th and 3 great blood vessels of neck, viz. internal jugular vein, internal and external carotid arteries pass deep to it. It’s a slight muscle that is located along the upper border of the posterior belly of the digastric muscle. It appears from the posterior surface of the styloid process. It’s fit into the hyoid bone in the junction between the body and greater cornu. At the insertion, its tendon divides into 2 skids that pass one on either side of the intermediate tendon of the digastric muscle. 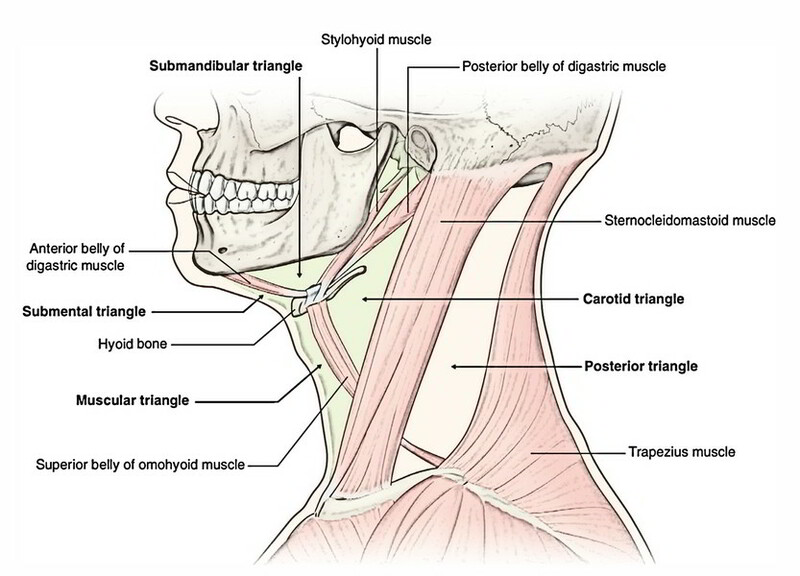 The stylohyoid muscle grows from the second arch and, hence, it’s supplied by the facial nerve. It pulls the hyoid bone upwards and backwards and elongates the floor of the mouth. 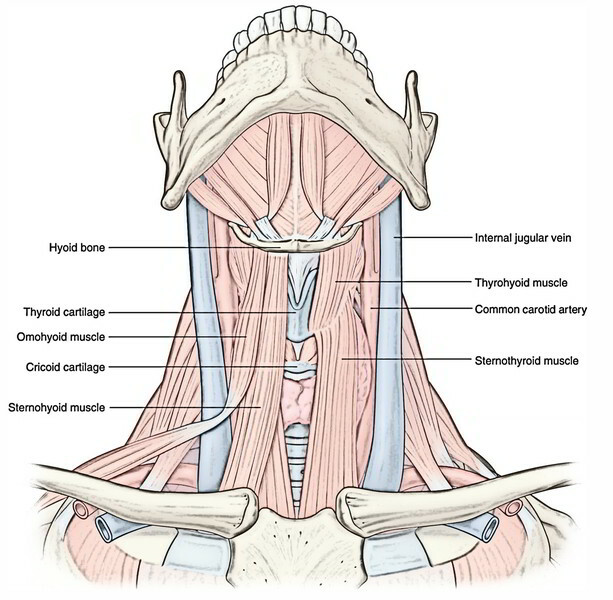 The stylohyoid muscle is regarded as the delaminated portion of the posterior belly of the digastric muscle. It’s a flat, triangular muscle being located deep to the anterior belly of the digastric muscle. The left and right mylohyoid muscles join in the median fibrous raphe to create the gutter-shaped floor of the mouth; over which is located the tongue, therefore the floor of the mouth is also termed diaphragma oris. From the mylohyoid line of the mandible. The fibres run downwards and medially. The posterior fibres are added into the body of the hyoid bone. The middle and anterior fibres are added into the median fibrous raphe going from symphysis menti to the hyoid bone. The mylohyoid muscle grows from the very first pharyngeal arch, hence it’s supplied by mylohyoid nerve, a branch of inferior alveolar nerve from mandibular nerve. The mylohyoid muscle elevates the floor of the mouth and therefore the tongue during the very first phase of the deglutition. It also helps in the depression of the mandible against resistance. It mends or elevates the hyoid bone. It’s a narrow muscle that is located alongside the midline deep to the mylohyoid. From inferior genial tubercle of the mandible. The fibres run backwards and downwards to be added into the anterior surface (front) of the body of the hyoid bone, above the medial part of the mylohyoid muscle. C1 fibres via hypoglossal nerve. The geniohyoid elevates the hyoid bone by pulling it upwards and forwards and therefore shortens the floor of the mouth. They may depress the mandible when the hyoid bone is repaired. The infrahyoid muscles are ribbon like and contain following 4 matched muscles. Rectus abdominis and pyramidalis (occasional) in the anterior abdominal wall. The connection of inferior belly of omohyoid to scapula is secondary to its migration from its first connection to medial end of the clavicle. The infrahyoid muscles are ordered into 2 layers with 2 muscles in every layer, viz. All are furnished by ventral rami of C1, C2 and C3 spinal nerves. The sternohyoid, omohyoid and thyrohyoid are supplied by the ansa cervicalis and its superior root. The thyrohyoid is innervated directly by a branch from the hypoglossal nerve taking fibres of ventral ramus of C1. All the infrahyoid muscles depress the hyoid bone following its elevation during consuming.